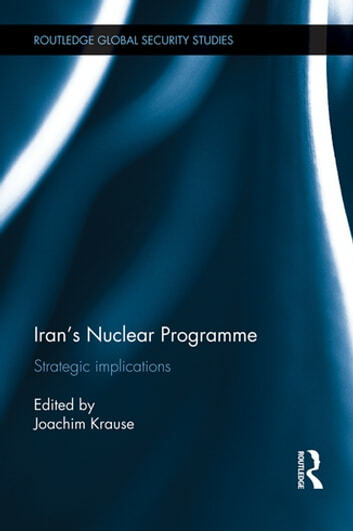 This book examines the strategic implications of Iran’s nuclear programme, providing an inventory of the negotiations and a discussion of possible solutions to this pressing international security issue. The Islamic Republic of Iran’s nuclear programme has been the cause of one of the most extended international crises of the past decade. Multilateral institutions have been unable to resolve the issue, which has the potential to derail the global nuclear non-proliferation regime. Recent failures of diplomatic offers for an extended Iran-EU cooperation and projected US arms sales to Iran’s neighbours suggest an imminent escalation of the issue, which has been simmering since first reports about Iranian nuclear fuel-enrichment activities emerged in 2002. Since then, the topic has been the subject of intense media coverage as well as academic and diplomatic debate. This volume brings together analysts and authors with diverse backgrounds, including international diplomats formerly involved in negotiations with Iranian officials. The various chapters bring together different perspectives and empirical analyses, and include detailed assessments of both US and European efforts in diplomatic relations with Iran, as well as of the domestic politics in Iran itself. This book will be of interest to students of Iranian politics, Middle Eastern politics, strategic studies, nuclear proliferation, international security, foreign policy and IR in general. Who Is Winning the War in Afghanistan?